Say hello to Gulshan kacha bazaar! I can't recall the last time I went to a kitchen market; must have been more than a decade ago. I remember walking along the aisles of Shantinagar bazaar holding my mother's hand in a time long gone. I recall the sellers sprinkling water on the fresh fish (the fish were fresh in those days), on the fruits and the vegetables. 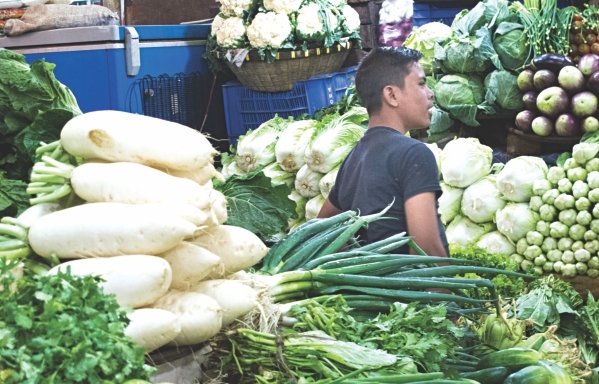 If you were a seller at a city bazaar in the late eighties, that's what you did splash water on your goodies, as opposed to adding formalin to keep them fresh. Fast forward to 2013 and we have dawned on the age of the superstore, where you can get the best of both worlds. But for old-school, seasoned shoppers like Shulogna (not her real name), going to a superstore is like an insult to her shopping prowess. When I said I wanted some squid to make fried calamari, she reassured me, “I know just the place for it”. Upon entering the Gulshan 1 kitchen market, I was greeted with the stuffy stench of Indian spices. Small shops stocked beyond capacity, selling spices of various kinds. “This is not you average spice trader,” Shulogna asserted with confidence, pointing to the various piles of spice and containers. I felt glad to be educated. Casually glancing at the goodies offered we came across the vegetable vendor. This was my comfort zone. I found the average assortment of veggies peddled around the neighbourhood in carts these days. But I also found bean sprouts, broccoli and herbs like thyme, celery and parsley. “It's not that you don't get these in the normal superstore or even at local bazaars, it's the quality of the product that makes the difference”. Shulogna reiterated. It was clear that I have a friend smitten by Gulshan 1 Bazaar. And I wasn't complaining. Eager to see what the fishmonger had on offer, I requested that we should shift to the aisle offering the fresh spoils. Amused by my persistence, Shulogna said, “But we are already there”. All I saw were large freezers; some wrapped around with iron chains and locked. I could not help but be astonished. I enquired, “Do you have squid?” The man smiled and said, “No squid today but we have good crabs”. Really? Now I wanted to have a look and when I did, I wanted to buy some. Shulogna, in all her sagacity suggested that I should go for the crab meat. “Much easier to process and you can also try the de-veined shrimps. Quite extra ordinary!” And there was more cuttlefish, octopus, etc. All just waiting to be picked. By then I was immersed in the whole shopping affair with retail therapy taking over. The fruit section was also amazing. Mangosteen and dragon fruit along with the usual assortment of seasonal treats. They were pricey but finding them under a single roof, away from a superstore, is difficult. My good friend Shulogna went onto do her monthly shopping and that is where Gulshan 1 market is best for. Having taken care of the fresh supplies, we moved on to the grocery where she bought the usual, monthly kitchen requirement. At the end of two hours of drifty shopping our hands were full. For me it was a learning experience that shopping beyond superstores is possible, even if it the most exotic of things in your wantlist. And as for Shulogna, I guess it was a re-acquaintance with a shopping paradise and an opportunity to introduce a friend to this wonderful world. The teeny-weeny island of Koh Nang Yuan is one of my top recommendations to those heading to Koh Tao, Pha-Ngan or Samui, Thailand. Three little islets connected by a long sandbar makes Koh Nan Yuang. It's a place where postcard dreams are made -- unique scenery, blindingly white sand beaches, shades of blue sea, and shores teeming with fish and coral. 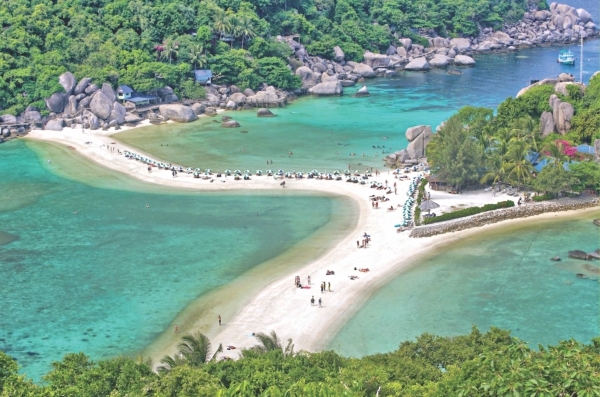 Koh Nang Yuan is the perfect size for a night's stay. Technically you can stay at the Nang Yuan Resort but it's fairly pricey and seems to cater mainly to Asian tourists. However, you would get to wake up to totally abandoned beaches before the day-trippers have arrived. Koh Nang Yuan is about a 20-minute journey from Sairee Beach, and about an hour's journey by a catamaran from Samui or Pha Ngan. There are advertised speedboat times and mega-catamaran Lomprayah offers a package day trip, but the cheapest and easiest option is to charter a longtail from Koh Tao. At any time of the day you can head to the beach and find a boat driver looking for customers. If it's a particularly busy day, head to Lotus, which functions as a bit of a boat-taxi stand during the day. The cost is 200 TBH for a round trip. You must settle on a return time with your driver. At first I was suspicious of paying up front and felt I would be left on the island but they always come back! Alternatively, if you have a Thai phone you can ask them to swap numbers so you can call when you would like to go back to Koh Tao. Koh Nang Yuan is a national park and to set your foot here, a 100 TBH fee has to be given. I wouldn't mind paying twice as it's gorgeous! Nang Yuan also requests that you bring no plastic onto the island. Everything on Nang Yuan is served in reusable glass bottles. Without a doubt, this is the main attraction. Moments after arrival, we were in awe of how crazily gorgeous its beaches were. Depending on the day, the season, the tides and your luck, the beach can be a tiny ribbon of sand slammed with sunbathing bodies, or a wide, deserted stretch of paradise. Amazingly, it remains beautiful either way. There's really no need for exaggeration -- Koh Nang Yuan simply is one of the best snorkeling spots in Thailand. The shallow reefs surrounding the island are lined with intricate soft and hard corals as well as schools of colourful parrotfish and shy angelfish. Shelter from the islands mean the water is calm and clear. You will often see dive boats surrounding Nang Yuan to visit the popular dive sites of Twin Peak and Japanese Gardens, which lie just off the island and are shallow enough for snorkelers. Gear can be rented in the Koh Nang Yuan Resort's Dive Shop, or of course you are free to bring your own. Another very popular activity at Koh Nang Yuan is taking the 10-15 minute hike up to the viewpoint of the three islands' highest peak. Despite its short distance, the path can get steep and in the heat of day might seem pretty tricky! But the view from the top, a vista that graces postcards across the country, is one of the most beautiful I have ever laid eyes on. By hiking to the viewpoint at the end of the day right before heading back to the boat you are more likely to have a lovely abandoned beach in your photos. Not to mention, it will be cooler, and photos of yourself will be less embarrassingly sweaty. Last but clearly not least is Koh Nang Yuan's newest attraction: ziplining! The course consists of two lines that go between the islands….the world's first inter-island zipline! The whole course takes about an hour and costs 1,000 THB, making it totally do-able during a Koh Nang Yuan day trip. There's really nothing like it! There is just one restaurant and food is definitely not the main attraction here. 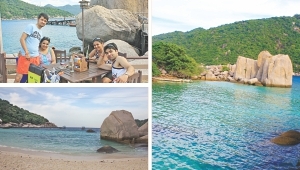 You can take a boat and lunch at restaurants on Koh Tao and be back to deserted beaches. It's a good idea to order Thai food at the resort restaurant. They have good chicken and seafood dishes that go perfectly well with fried or steamed rice. Burgers and steaks can be bad. If you're coming to Koh Tao, I know it's hard to resist the urge to spend every day there, given that its probably one of the farthest islands from the mainland but do take this as an opportunity to visit Koh Nang Yuang and you will be able the share the experience with so many. Very few dining experiences reach the level of ethereal like that which Thai cuisine brings. Thai food has often been considered to be a festival of flavours, but in truth, each bite brings every flavour to the fore in the most subtle of manners. Influenced by both Western and Eastern palates, Thai Cuisine still harks back to sepia-toned visions of a waterborne lifestyle. Meals generously sprinkled with aquatic plants, animals and herbs coupled with the toning down on large chunks of meat, the cuisine is a mismatch but one made in food heaven. The marriage of simplicity and complexity is done right, with panache. Now, the residents of Dhaka have the opportunity to enjoy this unique palate for themselves. Thai Emerald is the latest entrant in the growing casual dining scene of Bangladesh. Offering authentic Thai food under the expert guidance of Head-Chef Kan, whose resume includes the likes of Lemon Grass, among various other restaurants in Thailand and India. The presence of such an experienced chef adds an important element of authenticity to the taste of the food and the menu offered at Thai Emerald. Harmonising the various flavours in every meal is a Thai speciality and on this front Thai Emerald delivers. However, the harmony isn't merely restricted to the menu. The decor itself also follows suit, blending a soothing dining environment with the various elements of nature, as Thai cuisine deems necessary. The decor is as closely Thai-related as possible. A beautiful picture window frames the end of the restaurant area and is instantly noticeable upon entering. Bricks from century-old buildings from Shakhari Bazaar make up the wall, lending it a very dignified touch while fusing Thai decor with Bangladesh's famous Mughal period. Bamboo shoots line the area as yet another nod to the waterborne lifestyle previously mentioned whilst playing the dual role of bringing nature as close as possible. A visible kitchen area offers a glimpse into how the food is being prepared while also notifying one of the hygiene conditions of the service offered. There are booths, regular dining areas for big groups, a cosy corner and a soon to be open mocktail bar. The ambience is quite ethnic and pleasant, preparing one for the meal that is about to be served. The menu reads like the who's who of the Thai cuisine world, offering some never before served items. The in-house specialities are the ones to look out for. The emphasis is of course on sea-food and thus they must be tried out. The Fish -- steamed snapper with lemon, chilli and garlic and the Crab Meat Fried Rice are two firm favourites on this front. A unique take on Fried Chicken and the Fried Battered Prawn must also be tried out first. But before digressing into an overall list of the items on the menu, consider again the complexity and simplicity of the flavour. Owing to the diverse range of influence, Thai Cuisine has constantly evolved and adapted to the various palates of different groups. Be that the Chinese-led introduction of frying or the culinary addition of the French, Japanese or Portuguese, Thai cuisine is still considered one of the most evolving menus today. Thai Emerald's Massama Curry, Chicken Green Curry and Red Curry with Beef and Duck are three such examples. The Thai curries on offer contradict the popular notion of the very spicy curries, toning down the spices and replacing them with fresh herbs, giving the dish an intense yet momentary burn. This is one way of getting the best of both worlds. Another noticeable change is the use of coconut milk to replace ghee and other dairy products when the final meal is served. All these are remembered and upheld by Thai Emerald. The subtle use of lemon in various dishes and the use of fewer spices make the natural taste of the dishes more pronounced at Thai Emerald. With every helping, one can instantly taste the various elements combining, none over-powering the other, a balance which is truly hard to achieve. With almost all the grocery shopping done daily and a strong supply chain already established, there is an evident freshness to the food served. The use of oil is also restricted with the most distinguishable difference observed in the Tom Yam Soup which is made much less thick than that served elsewhere. The food presentation is also not too flashy, but it looks appetising enough. Furthermore, the nature of Thai Food makes any serving colourful enough. The thing one will enjoy the most is the delicate balance of flavours. The dessert menu too has a lot to offer. Our favourite is the Coconut Ice Cream, served with a helping of sweet sticky rice, a traditional dessert never before served in the city. Fresh coconut is used to make the ice cream and the presence of the sticky rice is a pleasant surprise. They combine very well and this can easily become the one item that makes you want to keep going back for second helpings. The tendency to offer only authentic Thai Food allows the scope to concentrate and specialise on this diverse menu only. "Since Thailand has been practically like a second home and given the growing potential of casual dining in Bangladesh, we decided to kick start our venture in Thai Cuisine", Shaker Ibne Amin, the proprietor of Thai Emerald says. With numerous equipment brought in from Thailand and ingredients such as Tom Yam paste, red curry and green curry all imported from Thailand, the authenticity of this casual dining place has been further enhanced. Shaker also informs that although the initial idea was to start a restaurant in Singapore, they started off in Bangladesh instead to gather experience in the industry. Now the plan is to expand and open newer chains in other cities and one more in Gulshan, although that will be an express service. A strong opening on 2 December, 2012 backed by word of mouth advertising has already made Thai Emerald a known quantity in the market. To say Thai Emerald is worth the visit is quite an understatement. With the locals already attuned to Thai cuisine, given how many of us have already visited the country, be prepared to feel at home. Classy, delectable and expansive, Thai Emerald offers a casual dining experience that makes eating out all the more memorable. As an added bonus, a team of 20 staff make the service and your evening, all the more pleasurable.